Human face is the most sophisticated and context-rich communication tool that ever existed. It was perfected for its purpose by millions years of evolution. Whenever we feel joy or sadness, become scared or surprised – our facial muscles contract and relax with precision and in excellent harmony. They deliver our message to the world. Just one smile can tell us much more than a thousand words. “I want my smile back!” This is the number one wish of all Bell’s palsy sufferers. To produce a genuine smile we need a highly coordinated work of many facial muscles. And that can become quite a challenge if the recovery takes longer than a couple of months. 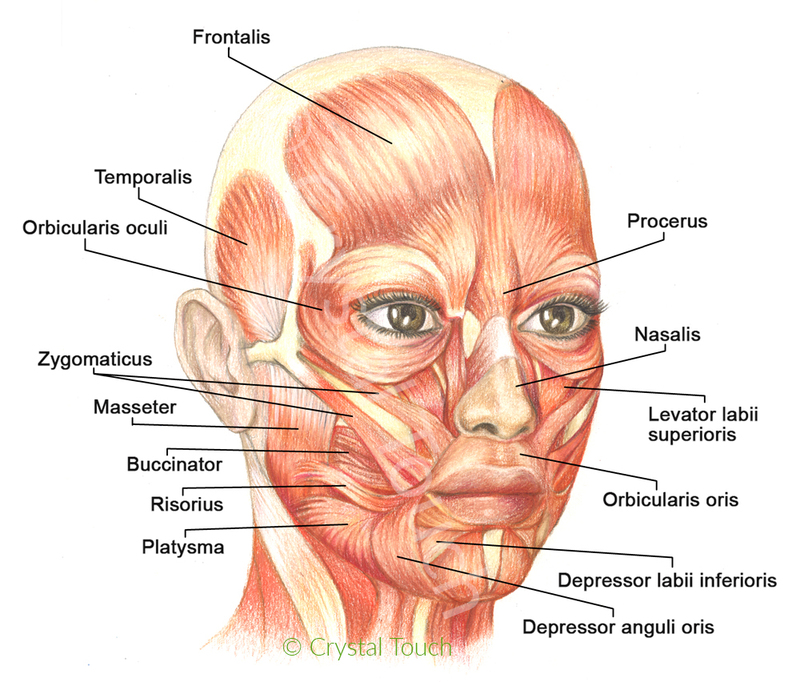 Let’s take a closer look at our facial muscles, their names and functions. Please study facial muscles carefully. This will be important later, when we discuss the causes and the recovery from facial asymmetry and from synkinesis. Synergists and antagonists. Muscles that “help” each other to produce a certain movement are called synergists. Muscles that produce movements in opposite directions are called antagonists. Frontalis muscle lifts the eyebrows, makes horizontal forehead wrinkles when we are surprised. Orbicularis oculi – circular muscle of the eye. Closes the eyelids, squints the eye. These two muscles are antagonists. Lift and hold your eyebrow with your finger and then try to squint your eyes. Difficult, isn’t it? Procerus is a frown muscle. Pulls medial sides of eyebrows down and together. Corrugator superclii – pulls eyebrows together. Zygomatic muscles (major and minor) move the mouth corners up- and outward when we smile. Risorius – “smile” muscle. Pulls mouth corners laterally (outward) and forms dimples in the cheeks. This muscle is not always active in all people. Orbicularis oris (circular muscle of the mouth) puckers lips and brings mouth corners towards the middle line. Depressor anguli oris pulls mouth corners downward. Levator labii superioris and depressor labii inferioris pull the upper and lower lips up- and down respectively when we grin. Mentalis (chin muscle) pulls up the chin as we express disappointment, doubt and some other negative emotions. Platysma is a surface muscle of the neck. Platysma is engaged in the expressions of fear, disgust and some other negative emotions. The “crooked”, asymmetrical smile after Bell’s palsy happens when depressor anguli oris muscle on the affected side is unnecessarily activated together with zygomatic muscles (its antagonists) while Bell’s palsy sufferer wants to produce a smile. In this “fight” the former muscle often wins over the latter, simply because it is larger and stronger. Result: mouth corner on the affected side ”looks down” instead of “up”. Quite often several small dimples may appear on that side of the chin, leading to a further disfigurement of facial expressions. Facial Synkinesis is another common complication of long-standing Bell’s palsy. There are several opinions in the medical world about the causes of synkinesis. The most popular (and still controversial) is the theory of aberrant regeneration or simply said, re-connection of the regenerating branches of the facial nerve to the “wrong” muscles. As a conclusion of this theory, Synkinesis is considered to be an irreversible complication of Bell’s palsy. 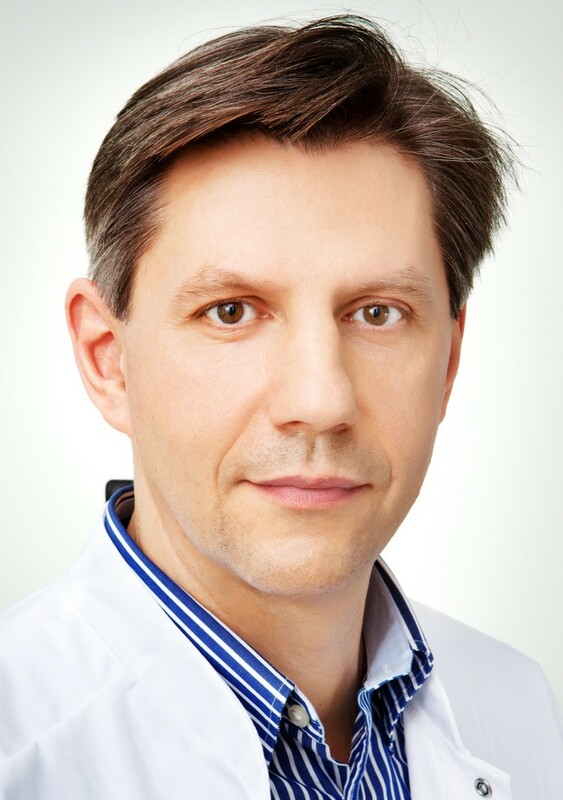 The results of an extensive scientific research at Crystal Touch clinic have demonstrated that with VERY few exceptions, facial synkinesis after long-standing Bell’s palsy have different origins. The actual cause of synkinesis is closely related to the higher cerebral activity. The recovery results of our numerous patients after 5, 10 and even 25 years since the onset of Bell’s palsy, prove that SYNKINESIS IS REVERSIBLE.